This past week I have been painting every day, layer after layer on the same painting. It is week six of the Life Book 2015 course and the second Main Lesson with Tamara Laporte, whom I love having the chance to learn from! I painted and painted, I lost track after the tenth time I found myself applying more layers of colour and bringing up the lines again …. and doodles. Doodles for Africa my friends. I am a person who should not be encouraged to doodle. I don’t have a ‘stop’ button and now I’m rather afraid the painting looks like it has a sudden attack of measles – or a very bad rash!! This is such a different style for me, though I didn’t stay so much in the abstract side of the venture but wandered into the whimsical as is my wont. I enjoyed the slow build up of colour, the challenge to place the right amount of dark and light shading and to blend just so…… I don’t think it’s a brilliant balance of colours, [not enough white and neutral spaces] but for a first go it’s okay. I loved being able to add in and add in and add in – the miniscule details all add up so that wherever the eye wanders there is something to look at, something to notice. For some of you it may be too much – it is for me – but the exercise was a great one for layering, building up blocks of colour and then somehow uniting them and for playing around with doodles [and for finding out I don’t know when to stop]. And here a some detail corners – highly magnified so you can see some of the layers and all the mistakes. I think there are certain little corners of the painting that I quite like. The colours blend well, the doodles are well balanced – something happened and it came together – but overall I find it a bit too much, what do you REALLY think? 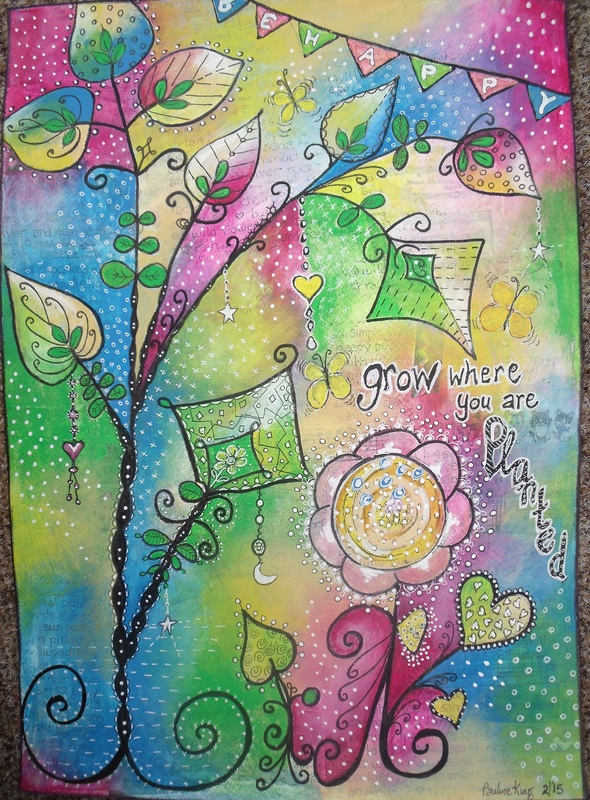 This entry was posted in Creations From My Craft Room and tagged doodles, grow where you are planted, Life Book 2015, mixed media painting, whimsical painting by thecontentedcrafter. Bookmark the permalink. This is gorgeous! I don’t get the sense of “too much” at all, and typically I’m sensitive to too much visual stimulation. All the bubbles and dots and crosses and beads form a consistent pattern, I think, sort of when you take a step back from something and it looks more like texture than the individual parts. Thank you for your thoughtful comment Crystal – I appreciate it so much and you made me think! When I first started painting I did one layer – maybe added/adjusted aspects of the work – but essentially it remained one layer. Increasingly over the past two years or so I have learned to paint a layer knowing most of it will disappear, yet it informs the next layer, which ‘informs’ the next layer – so it is like colour and shape speaking to each other. While I may start with an idea in my head, the finished product is often very different. It is a wonderful process for the painter – not necessarily the viewer as art is entirely subjective. Which does indeed mean that art is about feeling it! omigosh, I love what you said. Each layer informs the next. I have painted, and love it. And now I am going to think of what you said for what I paint in the future. I think it will give me more courage to take risks and make mistakes. Because… the process means the layer may disappear, but it’s important to the final product. I shall look forward to seeing what you create! Hi there…this is my first time stopping by for a visit…love the art and I love the meaning behind “grow where you are planted”….so many of us are always thinking about the next step, the next place, the next adventure instead of enjoying what THIS day has to offer. Pauline, your artwork embodies charm and cheer, joy and comfort. I want to live inside your artist world. I love the detail, the hidden messages that draw you in, draw you closer, and provide a tiny prize of delight. The colors evoke a springtime warmth, and the dangling jewels mirror a sparkle of invisibile sunshine. This piece just oozes health and happiness. My hope is that your art may be offered one day in calendar form, as every single morning I would take such pleasure in pondering over your pictures for a big dose of peace of mind. A nice, bright, feel good picture. I’ve been chanting: I will grow where I’m planted and I will blossom too. Oh Pauline our schedules are not the same:-( I am not at my computer that much anymore. I post on Sunday + now stay away from reading blogs not because I don’t want to, but because I am getting busy with life around me. Sorry again, I missed your post. I LOVE the new look. I love your girls still -but I love the doodles!!!! I love all the color + designs. I really love the detail in some of your “doodles.” It looks like you had fun! I see “happy” in these doodles and carefree:-) It is neat to try new things. i love the “muted” colors or washes you used. These doodles could be used on pillows or scarves-love them! I always love to visit:-) If I miss you and a few others it is like missing my weekly coffee visit! Your labeling it ‘whimsical’ is a great description. I would add, you give us a fantasy world to relax, fall asleep and dream in, Pauline! I appreciate your comment Robyn – thank you! You are of course quite right – no mistakes and it is done by a machine! I give my opinion honestly and freely in the hopes of sparking genuine responses. Not every one will like everything we create, art being a very subjective realm. Certainly, I don’t like everything I create. Every piece is a learning experience. 🙂 I like learning! I was back checking on your posts to see if there were any more news here. Just stopping by to say, “hi!” I did a baby name (Liam) with snow and monkeys and may have told you this. Then, just finished one with Legos and a boy who is looking at a rocket ship on the letters of his name, Ian. I have been doing more art work, must be the season to create! Snowed in and busy… Take care, Pauline! Pauline-you continue to amaze me. Such talent. I love the colors and the light-heartedness of your art. You have such a unique style. Such attention to detail. I sincerely hope you are busy making plans to capture a very large audience to share your work with! Thank you for sharing not only your work but the process it took to get there. Well, I am happy to be a part of your audience! Not only do I enjoy your art, but I enjoy your wit and your writing. Thank you kindly ma’am!! I am always made completely happy when someone says they would hang my work 🙂 It’s the highest compliment. I’m glad you like it! I REALLY like it! Especially the greens and yellows. Even better, I love that you are enjoying the process so much and that you’re painting every day! It’s funny because my eye is often drawn to yellows and greens because of their bright, lightness. I wanted to use green for my campaign colors. Ultimately I chose a royal blue and darker than lime green. Despite all that, when I buy wallets, phones, camera cases, etc I always buy red! Good for you for accepting the challenge. You clearly have talent! I love zentangling – I did quite a bit last year – or maybe it was the year before – and learned many patterns and their names and have now forgotten it all. Art journalling was what got me back to the canvas and paint. – you will love it and next thing we will know you will be making gorgeous paintings!! 🙂 How exciting!! What do I think? My friend, I think that everything you paint, everything you create is beautiful. I kept looking for the rash or the measles and couldn’t see any. I looked and looked at the corners for some kind of mishap, but found nothing. I like the hanging jewels (my interpretation). 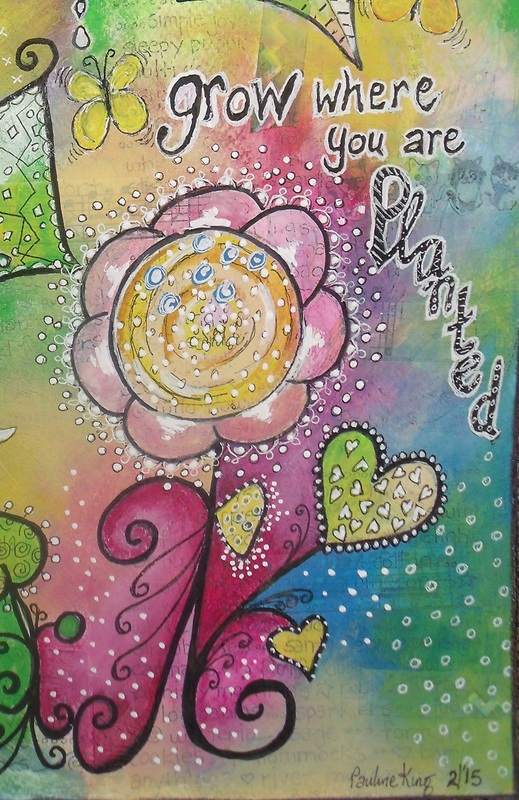 There are the beautiful blossoms.I just love the title: Grow where you’re planted. When I find myself in frustration situations, I usually chant: I am doing the best I can with what I have. I am now going to change that to: Grow and blossom where you’re planted. Thanks again for sharing your talent with us, Pauline. Have a great week! How wonderful Elaine! It is a great mantra isn’t it. We have everything we need right here, right now. The good earth, air and water, sunlight and gentle breezes, butterflies and bees – everything we need to blossom and grow wonderfully well. And even when the garden is cold and silent we are still busy beneath the earth, tending our roots and readying ourselves to step forth into the world once more. I am very happy to hear my work makes you smile – what a great compliment, thank you Jem! There’s a heap of stuff hidden in the layers – it is great fun to do! Wow, Pauline. Do you ever work with textiles? This made me think of silk, which would give it even more movement. It also reminded me of your dangler! It’s also nice to have something you can look at over and over and see something new. A bit like poetry. As far as color goes, it has a magical and tropical appeal (not sure whether one outweighs the other) and really, can you ever have too much color? This is great. Hmm…re the dangler, I think it’s the whimsey, but there are also quite a few little dangly things, and the sense of finding surprises if one keeps looking. Does that help? I think it is you—your unique style. It works wonderfully well in that it elicits a response from the viewer. I couldn’t help but be drawn into it, delighting in finding all the small treasures you place in your paintings. Then stepping back and taking in the whole. It’s wonderful and I enjoyed spending time looking at it. It’s beautiful Pauline, and no, it doesn’t look like it’s got the measles. I like the polka-dot effect. Question: do you paint over a written sheet or was the writing added along the way as you doodle? It really is pretty though 🙂 Great Job! Good question Char! The beginning layers include torn pieces of book paper and music paper. These are painted over, a layer of gesso was added, which tones down and unites random colours; then painted over again. Later I used a combination of music and word stamps plus words and phrases I wrote myself. Most of it disappeared, but is still intrinsically bound into the colours and influenced the way I worked on the piece. The doodling is the final step. 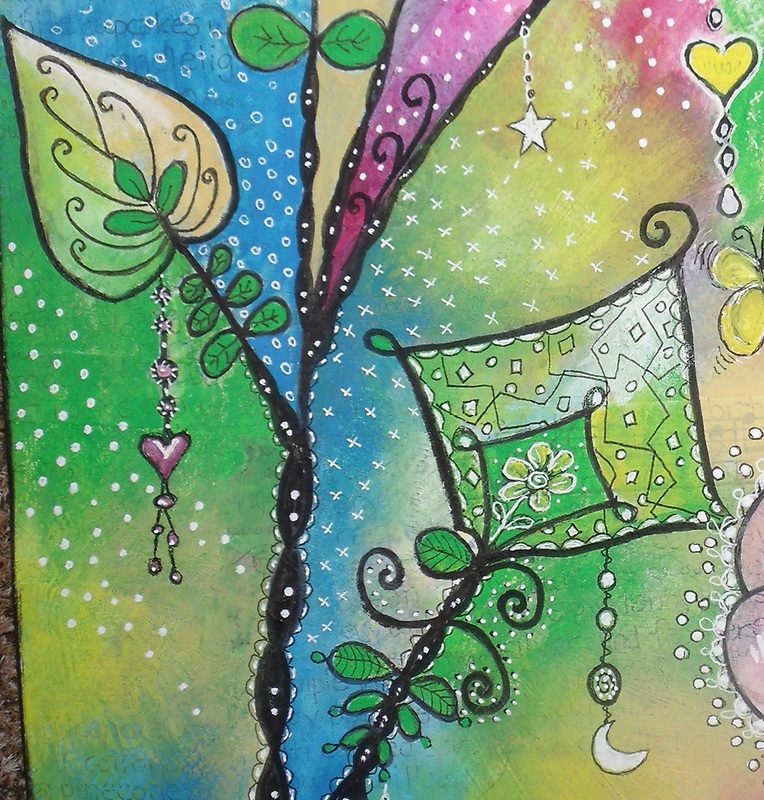 I like the colors and the hanging stars, moon, and heart ~> a HAPPY painting, for sure. Happy and BUSY too! 🙂 Thanks Nancy. These are joyful colours and the layering is fascinating – like Jill, I love all those hidden little phrases. As I’ve got to know you over the last few months through our blogs, I would say that this is very “you.” It’s so essential to have one’s own style and you’ve definitely found yours. It’s great the way you share the process with us too. Keep going, keep sharing – it’s wonderful! It’s like writing, every time you go in there is a bit that gets better. I am encouraged too. 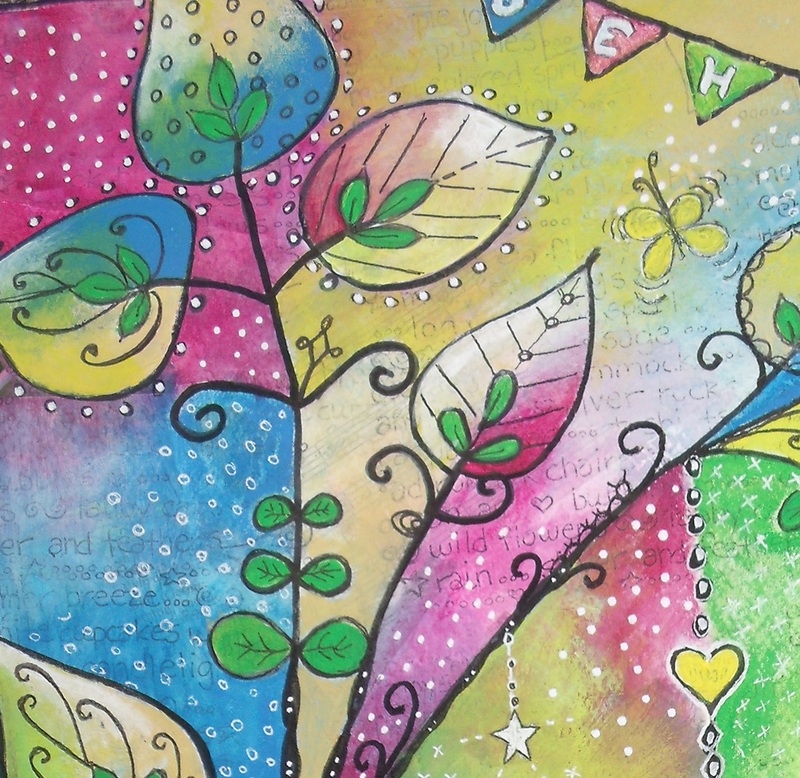 Love the colors … and whimsical is the perfect description (of course, in a good way). Well done!!!!! It’s the layering that intrigues me most–little secrets peeking out so you want to keep looking! Regarding your feeling of “going too far” with aspects–I guess the only way to recognize that is to actually go too far and see how it changes the painting. So that would make this a successful step in your development! I don’t think the color or doodles are too much at all–they’re happy and exuberant and definitely your style. I think maybe there are a few too many dots and bubbles for my taste . . . Yes a different style, but most definitely recognisably your lovely work, I’m happy to say. I love the delicate little charms hanging from the leaves. And I love that when we look closer, there are all sorts of treasures half-hidden by the paint – like that little row of kittens. Thank you for sharing more of your beautiful work with us. Thank you Twisted – there is a whole world hidden in the layers – the eye picks up little bits and pieces and makes a ‘feeling’ out of it – pretty cool huh! Wow, well thank you for saying that – it is whimsical again isn’t it – I can’t seem to get away from that style 🙂 Not that I really want to as I have so much fun working in it……….. I love all the little dangles with stars and moons and hearts and sparkles, and the kitties, of course. It all looks beautifully blended. I don’t find it ‘too much”. I think that’s because of the little bits of white everywhere and the pleasing appearance of yellow here and there. You are very kind Gallivanta, thank you 🙂 I don’t use much yellow when I paint normally, and I really wanted to have more in this one, I just kept blending it out. I need to try again in another painting and see if I can get that colour to POP!! I am having a small love affair with yellow at the moment, probably instigated by the unearthing of my children’s primary school artwork. Children are so brilliant with colour. I don’t think the colours are too much at all! It’s cheerful, light and quite lovely! I love that quote also, I had it hanging in one of the old houses I lived in. Doodling is great fun, it’s one thing I still do on occasional when I just want to draw for an hour or so….but yes, it’s addictive, I had one sitting on the table for a week while I worked on it but it was just black ink. I think it is fun to doodle with ink or even pencil or charcoal. I found having so many forms and so much space all of which allowed doodles, was quite challenging – and I definitely had trouble knowing when to stop! I loved the paintings!The colors are happy. The last one had more bubbles than I would like. I’m glad you are painting a lot again. I’m not a professional art critic; I just go by what I feel. The Louvre in Paris is filled with famous art, but my heart belonged at the d’Orsay where all the art deco furniture and impressionist paintings hang out in a light-filled, renovated train station. All this is to say that I like the way it makes me feel: I’ve always loved that quote, for many reasons. The colors you’ve used are happy. They make me feel good when I look at them. The piece also evokes your international dangler of happiness and that added another layer of goodness. I like all the details, the whimsy; hearts, flowers, kites, greenery and lovely pops of color. Your blending is really great. That’s something I didn’t really achieve with my version. Doodling is definitely compulsive.